¶ 2 Leave a comment on paragraph 2 0 In her article, “Disciplinarity and Disorder,” in Issue 1 of this journal, Gabrielle Dean opens her essay with a detailed and expressive “fantasy” describing the “primal scene of archival research [that] takes place in a dreary reading room,” featuring an archivist, a researcher, a cart, dusty gray boxes, and a “numbered file folder.” As her fantasy takes flight, with the researcher scribbling away and papers swirling and new collections sprouting up organically, she crafts an evocative metaphor for the life cycle of preservation and regeneration that archivists aim to enable through access to primary sources. Dean cogently deconstructs the origins and implications of this “primal scene” over the course of her essay. But what also merits highlighting in her opening metaphor are the accoutrements that populate it—the cart, the box, the file folder—familiar players on the stage of the archival encounter. These objects and symbols are evocative of that idealized moment of archaeological discovery that characterizes the use of the archive. They are objects and symbols of history, certainly, but relics, alas, of an analog age. ¶ 3 Leave a comment on paragraph 3 0 A similar fantasy, one potentially more fraught with anxiety and dread, must darken the reveries of archivists as they attempt to provide access to more contemporary materials. A daydream involving the researcher of tomorrow may instead feature dreadful moments of “file cannot be opened” error messages, of FTP transfers gone awry, of decaying media orphaned from long-lost playback devices. Our imaginary researcher will not be awaiting archival discovery sitting in a dreary reading room, but instead exist in some networked who-knows-where, furiously emailing an endless stream of access and transfer requests and constantly griping about obsolete formats and buggy interfaces. At the same time, our imaginary archivist will not be pushing carts or shelving boxes, but creating user accounts for virtual reading rooms, running pattern-recognition text-mining queries, uploading disk images, or helping users with emulation software. Like the content of our archives themselves, the props and symbols of our archival fantasies increasingly will be associated with born-digital materials. ¶ 5 Leave a comment on paragraph 5 0 But respect des fonds was born of a particular historic moment, for a particular type of archival document, and was conceived to address the practical needs of specific social circumstances. 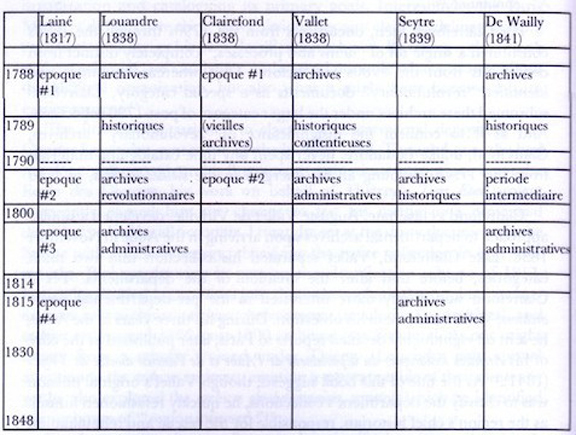 Even as respect des fonds has mutated and evolved over the decades, subject to revisions, contestations, and reaffirmations, its methodologies have largely been a product of the nature of the archival record as a physical document to be sorted, grouped, and described after receipt from a single donating entity. In an era defined by digital materials and their affordances and limitations, one in which narrative linearity often seems replaced by data-driven relationalism, the meaning of respect des fonds is ever more slippery. ¶ 7 Leave a comment on paragraph 7 0 The introduction of born-digital records into the archives offers an opportunity to examine how the practical methodologies of arrangement and description are shifting and how those changing practices lead to a reconsideration of respect des fonds. Much as digital records’ technological dependencies, ease of duplication, and subordination to features of systems and storage have led to a reassessment of the existing precepts of archival appraisal and selection, they also prompt a similar analysis of arrangement and description. One of those axioms due reassessment is the theory of respect des fonds. ¶ 8 Leave a comment on paragraph 8 0 This essay details the social and material conditions of the emergence of respect des fonds, the theory’s complex practical implementations and contested assumption, the emergence of alternate models, and how born-digital materials illuminate the theory’s analog origins and limitations. I will also explain the specific qualities of digital objects, including the nature of inscription and its impact on notions of original order and authenticity, as well as how nonlinear retrieval supplants the narrative logic of respect des fonds with a broader notion of context and discoverability. I will then consider recent interpretive methods, such as data visualization and text mining, as potential harbingers of new modes of representing and creating interfaces to digital collections—representations that better capitalize on the possibilities of digital materials. Finally, I will argue that the affordances of born-digital archives—such as their potential for parallel representation, machine-enabled interpretation, and expansive contextual and intellectual availability—provoke a reconsideration of the place of privilege of respect des fonds in archival arrangement and description. ¶ 10 Leave a comment on paragraph 10 0 Before respect des fonds can be respected, disrespected, or neglected, a better understanding of its origins is warranted, along with an examination of how the principle has (or has not) been applied and its periodic contestation. The seductive purity of the principle of respect des fonds often overshadows the concept’s decidedly complex origins. Respect des fonds as a guiding method of archival control was never as ennobled an idea as its contemporary evocation often implies. Its original articulation was mired in professional infighting, reductive practicalities, and the tumult and disorganization of political change. ¶ 11 Leave a comment on paragraph 11 0 Figure 1. Storming of the Bastille and arrest of the Governor M. de Launay, July 14, 1789. Those are probably archival records burning in the background. Public domain Image via Wikimedia Commons. Artist unknown. ¶ 17 Leave a comment on paragraph 17 0 A number of developments in the next few decades pushed this lack of uniformity to its breaking point and helped impel the conceptualization of respect des fonds as an archival principle, if, as I will show, less of an actual practice. The establishment of the Ecole des Chartes in 1821 created a formal institution to train archivists to staff both the Archives Nationales and the over 2500 provincial archives across France. Laws passed in the 1830s also drastically expanded the number of archivists mandated to work both in the Archives Nationales and in the provincial archives. Formal training and new positions, however, when combined with lax oversight and inconsistent guidance on practices, led, predictably, to a near-comic proliferation of methods of classification and arrangement. (See Figure 2.) Due to the proliferation of classification systems and schema, change was inevitable. ¶ 18 Leave a comment on paragraph 18 0 Figure 2. The many arrangement methods of some Ecole des Chartes graduates prior to the emergence of respect des fonds as a methodology. Image from Lara Moore’s “Restoring Order,” 114. ¶ 21 Leave a comment on paragraph 21 0 The principle was, in fact, a practical exigency, a method to simplify archival arrangement seen as more easily implemented by novice archivists than the more rigorous arrangement by classification. Bartlett also notes that respect des fonds remained absent from both the curriculum of the Ecole des Chartes as well as the publications of the professional society of its graduates. 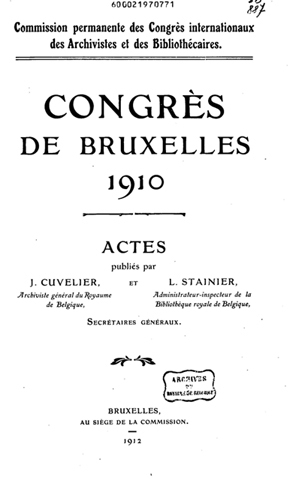 Lastly, the principle was, at the time, not applied to accessions into the Archive Nationales itself, as it operated under a different administrative department than de Wailly’s Interior Ministry. ¶ 22 Leave a comment on paragraph 22 0 Respect des fonds, then, was never a perfectly realized theory. 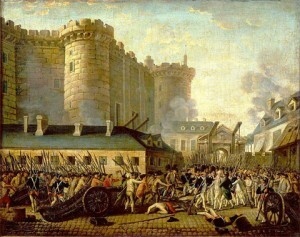 Its formation was a contingency of a unique historical moment; its conception depended upon practical necessities and its implementation was inconsistent and disputed. What today seems near dogma—that archives be arranged by fonds—was at the time novel and simplistic, more the product of utility and political manipulation than a grand inspiration regarding the functional authenticity of fonds or evidential purity towards their arrangement. ¶ 23 Leave a comment on paragraph 23 0 Figure 3. 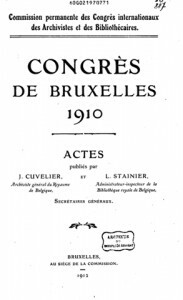 Front page of the proceedings of the 1910 Congres de Bruxelles, the First International Congress of Archivists and Librarians. The full proceedings are available online at http://extranet.arch.be/congres1910/menu.html. Google Translate does a passable job of translating. ¶ 26 Leave a comment on paragraph 26 0 The Dutch Manual, and the methodologies implemented in its wake, not only forbid the intermingling of the fonds of one agency with those of another—in keeping with the French conception of respect des fonds—but also expanded the theory to apply to the records within each fond—the internal arrangement of the archival collection. Or as the Dutch Manual put it, “the system of arrangement must be based on the original organization of the archival collection.”16 This concept has come to be known as the “principle of original order,” an intra-fonds corollary to the external means of arrangement associated with the principle of provenance; respect des fonds encompasses both principles. ¶ 30 Leave a comment on paragraph 30 0 Figure 4. 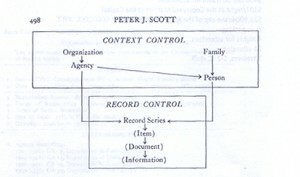 Peter Scott’s diagram depicting his system of archival arrangement based on grouping records at the series level. 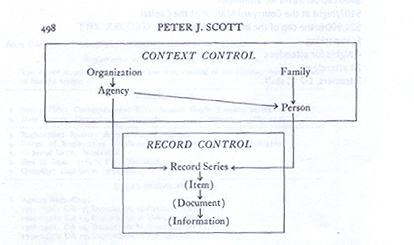 From Scott, “The Record Group Concept: A Case for Abandonment,” 1966. ¶ 32 Leave a comment on paragraph 32 0 The principle of original order underwent a similar critique. A lack of clarity on the custodianship of records prior to their delivery to an archive, the problem of multiple and ongoing accessions, and the potential for incoherent or unknown methods of ordering or classification by creating bodies all led Fenyo to proclaim, “archivists generally believe that the arrangement of series within a record group reflects to some extent the organization and even history of the agency that created those records.… But the records in the National Archives reflect no such thing.”23 For archives consisting of personal papers, original order is seen as particularly problematic, since a chronological arrangement seemingly provides the greatest meaning and value to the records of an individual, but is unlikely to be the order of records upon accession. Restoration of original order also risks destroying the contextual information accrued by collections that have passed through multiple states of custodianship prior to their acceptance into the archive.24 Lastly, the principle of original order prioritizes filing systems of unknown or dubious legitimacy over the principle of use or accessibility. As Frank Boles states, “usability acknowledges the evidential superiority of documents over filing systems by placing primary emphasis on access to documents.”25 In this critique, usability and original order are often in conflict. ¶ 35 Leave a comment on paragraph 35 0 Perhaps the most exhaustive attempt to deal with many difficulties that exist within the gulf between respect des fonds as principle and practice was undertaken by Michel Duchein in 1983.29 While Duchein proposes solutions to the many problems of the fonds concept, the reader cannot help but be overwhelmed by the fact that his cataloging of the “theoretical problems” and “practical difficulties” far outnumber, and begin to drown out, his proposed solutions. For Duchein, within fonds there can be all sorts of nebulous, arbitrary, and forgotten methods of classification “from which all imaginable disorders flow.” He calls these, in a poetic moment, “brutal manipulations.”30 But after this disquisition, on the last page of his article Duchein mentions one idea that seems if not prescient, then at least transitive in the way it conceives of context: the parallelismus membrorum, “the similarity of parallel files.” Parallelismus membrorum is a rhetorical term referring to the patterns within a text formed by the utilization of repeated grammatical structures. (“I came. I saw. I conquered,” is a brief example). Duchein here employs the motif to refer to the contextual relations that exist between records of different fonds, the network of meanings that stretch across the archive. ¶ 37 Leave a comment on paragraph 37 0 Chris Hurley explored an idea similar to parallelismus membrorum in his delineation of “parallel provenance” a concept built around “composing different things from the same particles—combining things in different ways to produce a variety of views of what they look like in the aggregate … not so much about identifying a different creator as recognizing manifold context.”31 (See Figure 5.) Other contemporary writers, such as Laura Millar and Geoffrey Yeo, have sought to stretch the meaning of the fonds even further, arguing it exists purely at the conceptual level.32 But as the definition of the fonds becomes more distant, more abstract, its privileging as a form of aggregation seems less certain, especially in a digital environment in which creatorship is but one of many means of grouping records. ¶ 38 Leave a comment on paragraph 38 0 The archival bond, the series system, parallelismus membrorum, and parallel provenance all mark attempts to theorize relationships between records and collections in ways that can elide the practical problems of respect des fonds. Equally, these ideas represent a continued expansion of context beyond the limitations of grouping by creatorship or creator-derived order. In each case, similarities and dependencies emerge out of cross-collection networks or semantically derived principles. As the models gain distance from the vagaries of the individual records, one starts to recognize a familiar pattern of removal—not a disjunction, exactly, but a subtle passage from the material trace to the abstract representation. The familiarity is borne of the similar movement from item to representation that characterizes electronic records and their attendant phenomenological tension between the physical inscription on a drive and the symbolic interface on a screen. ¶ 40 Leave a comment on paragraph 40 0 But enough of models. Consider instead the bit, the binary, the magnetic flux reversal of the spinning disk that is the origin of the digital object. Material inscription offers a good point to segue into an examination of digital records and how they both complicate or even circumvent historical notions of respect des fonds while at the same time enabling realization of a more expansive notion of context and interrelation. ¶ 41 Leave a comment on paragraph 41 0 Starting at the bit level, the characteristics of inscription (how digital information is written onto storage media) call into question the idea of original order. When data is written to a storage device, it has a material, physical trace, but that trace is far from the legibility or interpretability we associate with analog documents. As Matt Kirschenbaum has noted in his study of new media and digital forensics, “we write on paper, but we write to a magnetic disk (or tape)”; the semantic difference signifies that the act of inscription is “logically distinct” from the act of creation and intellectual manipulation.33 (See Figure 6.) 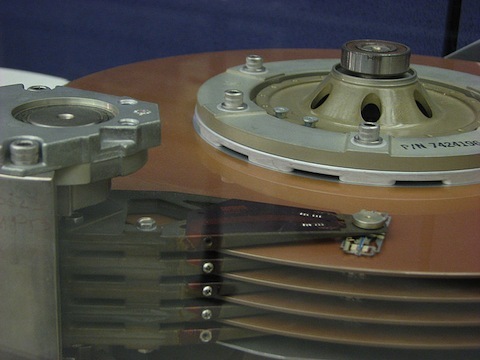 In addition, a key component of storage media is that it is random access; that means the bits composing a record are inscribed to available clusters across the platter of a drive depending on which tracks and sectors are available for inscription. That is, the component bits of a digital object are non-sequential in their material physical arrangement. Aggregated, they can create an interpretable object, but their component location is nonlinear. Here, even at the bit level of a single item, there is no original order. Furthermore, each time these bits are reconstructed, each time the file is accessed and translated into an interpretable, editable representation, the file will be altered in minute ways (for instance, a file’s “last opened” date) and thus be composed of a new order as new bits are assigned to other available areas of the disk. As Kirschenbaum notes, quoting a dictum of forensic science, “every contact leaves a trace.” The act of interpreting a digital object, thus, continually alters its material order. ¶ 42 Leave a comment on paragraph 42 0 Figure 6. 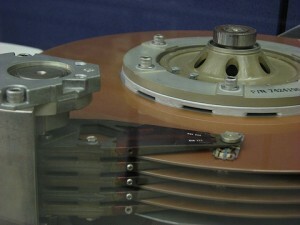 Close-up of a disk drive at the Computer History Museum, showing arms and a read/write head. Processing Born-Digital Materials Using AccessData FTK at Special Collections, Stanford University Libraries, 2011. ¶ 43 Leave a comment on paragraph 43 0 Moving beyond the non-sequential arrangement of bits of individual records, but remaining at the forensic level, other features of the digital environment challenge long-standing presumptions of authenticity and uniqueness that are dependent upon physical arrangement or description. Temporary files, such as those stored by auto-save or recovery programs, mean that a drive can contain multiple versions of identical files, many of them beyond the management (or even awareness) of their creator. This “ambient data” is matched by other features of data dispersal throughout a storage system, such as “swap space” (disk space sometimes allocated for use by RAM) and “disk slack” (which accounts for the difference between the actual file size and the disk space used for storage) that themselves complicate ideas of order and linearity. Storage becomes a hidden, dynamic world in which physical arrangement on a spinning drive consists of the equivalent of dispersed crevices, hidey-holes, and secret areas where data proliferates. Kirschenbaum asserts, “there is, in short, no simple way to know how many instances of a single file are residing in how many states, in how many different locations, at any given moment in the operating system.”34 As well, digital objects themselves have the potential to contain trace data that, while possibly not achieving the singular identity of a record, can have evidential value or help establish provenance. ¶ 44 Leave a comment on paragraph 44 0 Take, for instance, Kirschenbaum’s exploration of a floppy disk image, in which he finds evidence of how the storage media was used over time and what its hidden and partially deleted data can manifest about its user: “[W]e discover on the original diskette the incompletely overwritten remains of previous software … a piece of 1980s software culture frozen in allographic amber.”35 Discovering this legacy information reveals multiple levels of creatorship and a trail of ownership and social and cultural meaning that extend beyond the object, the creator, or the fonds. In this case, the unintentionally preserved (by the user, at least) data provides a testament to its origins that is not visible in the individual files themselves. Here provenance is not a result of aggregation or description but a characteristic of how digital information is created and transmitted. Context is not just relational, implied, or conceptualized, but can be a part of the very media itself, like secret, half-formed barnacles clinging to the vessel of the digital record. Incomplete but decipherable. Fragmentary but meaningful. Allographic amber. ¶ 46 Leave a comment on paragraph 46 0 Needless to say, most people do not interact with digital information at the forensic level. In Kenneth Thibodeau’s useful model, digital objects are compounds, composed of a physical, logical, and conceptual object. Respectively, those adjectives refer to the physical inscription on storage media; the logical suite of translational software and processes that access and “read” that inscription; and the conceptual object the user interacts with, such as the text, image, or interface on a screen.36 The conceptual object—the representational environment of the screen as experienced in the word processing program, the image editor, the social media app—inculcates its own affordances and logic on the creation or use of records. In fact, given the hidden, inscrutable nature of storage and inscription, the formal representation of digital objects on a screen can have an outsized influence on their creation, management, and perception—an interpretive tendency that Nick Montford calls “screen essentialism.” Considering the extensive influence that the theory of respect des fonds has had, historically, on how archival collections are arranged and described, a similar predilection may characterize the archival enterprise—call it fonds essentialism. ¶ 47 Leave a comment on paragraph 47 0 The conceptual object—the screen—presents its own challenges to the implied narrative of current modes of archival description. The way that a user interacts with an aggregation of digital materials is fundamentally different from how a user would interact with a set of document boxes or a finding aid. The screen imposes its own logic, its own “formal regimen,” in Kirschenbaum’s terms, on how digital objects are interpreted or accessed, but also how they are described. Traditional archival representation for analog materials emerges from a narrative: a story about what a collection is, what it holds, and the order and location of its contents. It moves through a descriptive summary of contextual detail and administrative information and on to a hierarchy of series and subseries often arranged by type, function, chronology, or other broad categories. Papers, folders, boxes, and series must be arranged in physical space, after all, and that comes to shape how they are arranged in the intellectual space of description. A finding aid is a narrative to be read and its intellectual availability is largely linear and structural. The conceptual object of the digital record and the interface to an aggregation of digital records offer quite a different type of interaction. ¶ 48 Leave a comment on paragraph 48 0 Text mining and hyperlinks are simple examples of ways to navigate large groups of materials absent a singular narrative sequence. Lev Manovich, in theorizing new media, has noted that the database (or, the database logic) has supplanted narrative as the method of interacting with digital information. In new media, “narrative becomes just one method of accessing data among others,” and digital information assumes “the projection of the ontology of a computer onto culture itself.”37 In a database, objects are related but not ordered. The database logic is nonlinear and there is no original order because order is dependent upon query. Search and navigation become algorithm-dependent and not predetermined by a creator, an archivist, or a static finding aid—though all of those organizations are themselves available. Digital objects will have an identifier, yes, but where they “rest” in intellectual space is contingent, mutable. The key point is that, even at the level of representation, arrangement is dynamic: access and representation need not depend on the fonds. Description becomes relational as well and can extend beyond individual aggregations of records. The logic of physical space no longer drives retrieval or predominates in description. Original order and provenance are not lost or obviated in this model, but they are not the exclusive means of access, either. ¶ 52 Leave a comment on paragraph 52 0 Though the many technical processes necessary for format validation, emulation, automated metadata extraction, and other methods of processing born-digital archives are too complex to be fully recounted here, these case studies point to their key characteristics. (See Video 1.) Arrangement, as we think of it, is no longer a process of imposing intellectualized hierarchies or physical relocation; instead, it becomes largely automated, algorithmic, and batch processed. At the same time, archival representation will build upon the affordances of the digital objects themselves to extract and compile metadata that can then be repurposed to bridge and augment a wealth of contextual relations far beyond the order of their creation and their agency of origin. Video 1. Processing Born-Digital Materials Using AccessData FTK at Special Collections, Stanford University Libraries. 2011. ¶ 58 Leave a comment on paragraph 58 0 There are, however, some archival projects, as well as work in the digital humanities, that offer a window into how researchers and scholars are making using of large sets of digital data. 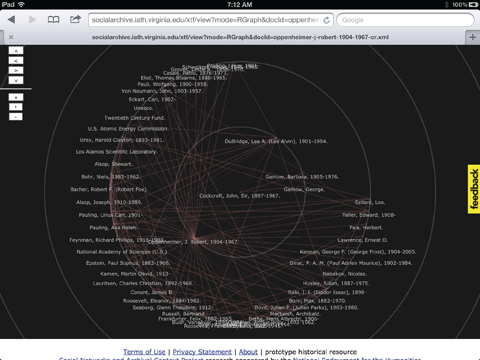 While the data sets and digital records being utilized are not necessarily archival collections, the tools, methods of inquiry, and cross-collection, multi-institutional repositories that emerge from these projects presage both how entirely born-digital archives may come to be used and what digital archival collection interfaces may look like in the future. ¶ 59 Leave a comment on paragraph 59 0 Figure 7. Image from “Data Mining with Criminal Intent” presentation by Briquet et al. at Digging into Data Challenge, Washington D.C., 2009. Slides available at http://criminalintent.org/wp-content/uploads/2011/06/criminal_intent_digging_into_data_meeting_10jun2011.pdf. ¶ 60 Leave a comment on paragraph 60 0 Two projects taking an innovative, insightful approach to exploring archival collections through the mining of large archival corpora are The Proceedings of the Old Bailey Online and Cameron Blevins’s work text mining and topic modeling Martha Ballard’s diary.44 The Old Bailey Proceedings provides access to nearly 200,000 digitized trial records from London’s criminal courts, spans almost 250 years, allows full text searching, and has an API through which users can query the archive. The With Criminal Intent project has built a suite of related tools that can help perform data-mining projects using this archive. (See Figure 7.) 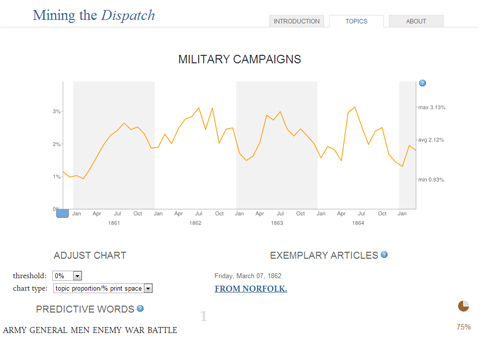 This project measures and visualizes trends over time as a means of revealing historical themes, building and revealing new narratives, and providing insights into the past through data-driven analysis. ¶ 62 Leave a comment on paragraph 62 0 Figure 8. 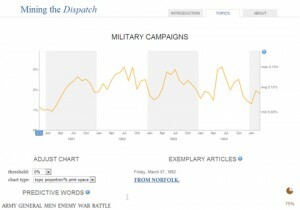 Screenshot from “Mining the Dispatch” website, http://dsl.richmond.edu/dispatch/Topics/view/27. ¶ 66 Leave a comment on paragraph 66 0 Figure 9. Image from “Historic Social Networks” presentation by Brian Tingle at SAA 2012 Annual Meeting, San Diego, CA. Slides available at http://socialarchive.iath.virginia.edu/images/NAAC-dc-2012_SAA2012_Tingle.pdf. ¶ 67 Leave a comment on paragraph 67 0 Figure 10. Network analysis of Robert Creeley email archive. 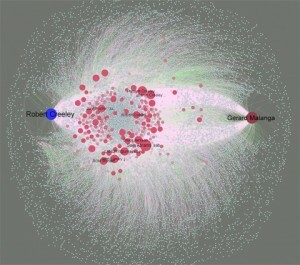 Image by Elijah Meeks, captured from https://dhs.stanford.edu/visualization/robert-creeley-e-mail-correspodence-network/. Video 2. Visible Archive Series Browser, Mitchell Whitelaw. 2012. ¶ 69 Leave a comment on paragraph 69 0 What distinguishes these projects from archival representations of old is that context and meaning are not exclusively provided through descriptive, narrative details that precede an arrangement and location list, but instead through networks, inter-linkages, modeling, and content analysis. Users can move dynamically within a collection and laterally across collections. Search, query, and tools like topic modeling also allow the user to build their own patterns and hierarchies for discovery. In this view, archival description still plays a crucial role in providing information on what something is or how it came to be created, but no longer is the fonds or idea of original order the sole determinant of representation. ¶ 71 Leave a comment on paragraph 71 0 As Luciana Duranti has noted, archival description “has been carried out or not carried out depending on specific needs and conditions, attitudes and requirements, and its products have consistently reflected the conceptions about archives held by the society of the time.”48 In the physical world of items, folders, boxes, and shelves, the archive must be sorted, ordered, and stored sequentially in space. Those properties, along with social, cultural, and political attitudes have driven how archival arrangement and description are theorized and practiced. Indeed, description itself has always had to serve multiple purposes: to provide historical or biographical information, scope and content detail, physical location for retrieval, administrative information for ongoing management, and restrictions and material types governing use. In a sense, description itself is a compound object, tugged between the needs of physical arrangement, intellectual representation, and user expectation. The properties of digital records allow archivists to revisit that negotiation. At the same time, other qualities of digital information, like the forensic disk image, have the potential to preserve both a mechanical version of “order” as well as provenancial and contextual information that formerly were provided through description. File fixity, forensic imaging, directory manifests, and auto-generated metadata may all come to play a larger role in defining provenance. ¶ 72 Leave a comment on paragraph 72 0 We disrespect des fonds, then, not as an act of elimination or insubordination, but in order to bring other contextual relations to its same level of privilege. Consider it less a disrespect, perhaps, than a humbling; or, instead, consider it a reaffirmation that the multiplicity of meanings possible with digital records can be better realized through an ongoing interrogation of archival traditions of arrangement and description. In rethinking respect des fonds, we gain a better awareness of the extent to which the material affordances of paper records have had an undue influence on how we conceptualize and practice grouping and describing collections. Bits, however, are fundamentally different at the material and symbolic levels. The use of digital objects is different as well, influenced by computational processing, algorithmic query, automation, and dynamism, not to mention social conditions, user expectations, technology dependencies, storage requirements, and a host of other characteristics of how we create and use technology. ¶ 73 Leave a comment on paragraph 73 0 Parallels and bonds, series and topics, models and paradigms; at times these concepts have collided and resulted in a seeming antagonism between ideas like original order and random access, historical contingency and abstract principle, finding aid and dynamic query. But there have been similarities too: how the tension between record and representation mirrors that of inscription and screen; and how the component nature of digital objects resembles the component purpose of traditional archival description. To entrench methods of arrangement and description borne of the qualities of physical collections is to disregard the potential expansion of context that digital information can support. In recognizing how historically and socially contingent traditional practices (and the theories spawning those practices) were, we better recognize their potential dysfunction in a time of born-digital records. This is not to say that we should discard the idea of the fonds or the utility of original order, but perhaps it is time to revoke their privileged place in archival discourse and revisit the true goals of arrangement and description in light of the capabilities of digital records. Maybe then we can begin to understand what is possible when we think of collections as mutually contextual and interrelated instead of cloistered and static. And perhaps then other bonds, other parallels, other contexts, meanings, and interpretations can receive the same amount of respect that we have, for too long now, granted the fonds.